And meanwhile your liver is rotting, jaundice eats your flesh, you can’t keep your hands off the Moselle. You are dung, sir, forgive the directness. Two years later, the chronic illness that would soon kill him, at age 57, began to worsen. A defiant and despairing Karl, now 20, strangled by Beethoven’s arbitrary and absolute rule, threatened suicide. 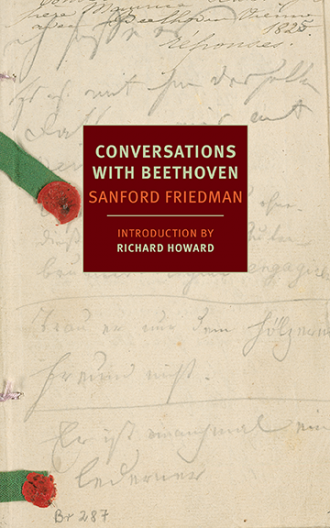 It is here that the playwright and novelist Sanford Friedman, best known for the 1964 gay themed novel Totempole, picks up Beethoven’s story, transforming the composer’s last year into a strange and absolutely compelling symphony of need called Conversations With Beethoven, just published by NYRB Classics. The deaf Beethoven’s friends and family, as well as his doctors and advisors and sycophants, had to speak to him through written notes, scribbled in “conversation books.” Beethoven would respond in his increasingly strident voice; if he was worried about who might hear he would write his rejoinder in a separate notebook. Friedman adopted this form to his novel: the majority of the book, aside from a few letters and occasions when Beethoven would write instead of talk, is this seemingly one-way dialog. Here is Karl in Beethoven’s room at the country house of Beethoven’s brother Johann, whose wife, like all women, the composer despised and accused of depravity—often, as in this case, toward poor Karl. Not with me, she was hoping to play with you. You! you! you! I accompanied her only because you refused. Needless to say, there is not room at the keyboard to place the chairs more widely. Presumably she removed her stole to free her arms. I didn’t notice the talcum powder. You are utterly mistaken if you think she “pressed herself” against me. I don’t know what you are aiming at or, rather, I do know and find the notion ludicrous. God is my witness, I have no such interest in Fat Stuff. If you don’t believe me, then let us drop the subject. To go to my room, naturally. Once he adjusts to the form, the reader can’t help but engage in this absorbing literary game. He may even pencil in the maestro’s responses from time to time. The silence—or absence of one side of the conversation—gains power as Beethoven desperately seeks to control Karl and the others around him. The void becomes the solid, the thing, as Beethoven grows increasingly desperate and sick, and dissolute. The potent silence is all the more poignant because, as the poet and translator (and long-time partner of Friedman) Richard Howard points out in the book’s introduction, when Friedman finished Conversations With Beethoven in the late 1980s he expected it to be not “his last but rather latest book.” Instead, no publisher picked it up. For twenty years, until his death in 2010, Friedman was forced to confront the publishing industry’s withering silence (a familiar torture, indeed). Howard notes Friedman’s twin “compassion and contempt” that fed the work, that breathed life into the icon Beethoven. Now Friedman, thanks to Howard and NYRB Classics, has been given voice, and through him Beethoven an extraordinary depth of humanity. Historian Paul Johnson says that “Beethoven was a key figure in the birth of the modern because he first established and popularized the notion of the artist as universal genius.” That genius is wonderfully missing here. We rarely see him at work, and if he is working it’s to ensure he gets properly compensated, or that a composition is adequately printed. Mostly, instead, we get an angry, contemptuous man confronting death and loss of control. Karl survives and Beethoven rushes to his aid. But does he really love the boy he forcefully keeps separated from his mother Johanna? (Beethoven had accused her of poisoning his brother, Karl’s father.) It’s hard to see it at first—Beethoven seems not only deaf, but blind to the natural urges of a twenty year old. But keep reading—Friedman’s control and care with the language is sublime—and soon you can’t help but feel, as Karl finally goes off to begin a career as a military officer, that it’s Beethoven who has been abandoned. Friedman punctuates the betrayal with a brilliantly teased final letter from Johanna to Karl, who in the final moments of the musician’s life had composed his own anguishing silence.